New Cameroon coach Jean-Paul Akono says his first order of business will be to seek a return to the team of disaffected captain Samuel Eto'o. Defender Benoit Assou Ekotto will also be invited back to the national side. Akono said both players were needed if Cameroon were to fight back from a two-goal deficit and avoid elimination from the next African Nations Cup finals. Akono was appointed on Thursday to replace Frenchman Denis Lavagne after the Indomitable Lions suffered a shock 2-0 defeat to Cave Verde in the first leg of their final round qualifier last weekend. Cameroon host the second leg in Yaounde on 13 October. "I want to work to fix all the conflicts that are within the team," he said within hours of his appointment. "We are going to have to forget all these issues if we are to avoid missing out on the Nations Cup finals again. "I hope to meet Samuel Eto'o Fils once my plan of action has been approved by the Minister of Sports. "I will also meet Assou Ekotto and Jean Armel Kana Biyik, all the players who refused to come back to the national team." Akono said he knows he has his work cut out especially given the team's recent failures. "This is a very short appointment and a somewhat difficult task, because we have to fight back from two goals down to qualify, which is difficult in this type of competition but not impossible. 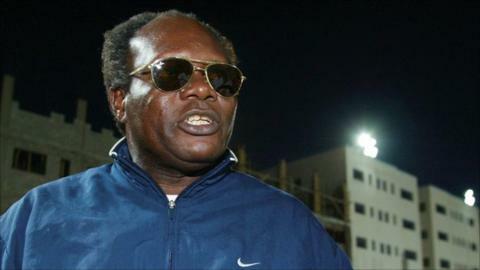 "It will be shameful for Cameroon to be absent from two consecutive editions of the African Nations Cup. "We have to put our energies together to ensure that Cameroon qualifies for the African Nations Cups," Akono said.